This is my latest favorite recipe! I love this and so will you! Cuttlefish are related to squid and octopus, and taste closest to squid. Tasted blind, you might not know the difference. If you cannot find cuttlefish locally (I can usually find them frozen at local Demoulas Supermarkets, and occasionally fresh elsewhere), feel free to use squid for this rocking recipe! This is a fairly simple and breathtaking recipe. I made it up myself, using some Internet recipe research for inspiration, and after making it a number of times this is the final version. I usually make it in the morning and then leave it in the fridge until I cook it later that night. You can make it the night before if you'd like. 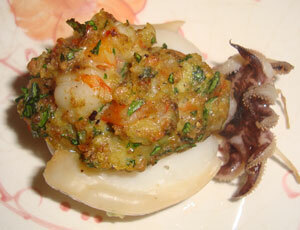 These cuttlefish are both great as appetizers as well as a main course. Cook the onion in the olive oil over low heat until translucent, then add the 2 cloves of chopped garlic. Cook briefly until you can smell the garlic, maybe 30-60 seconds. 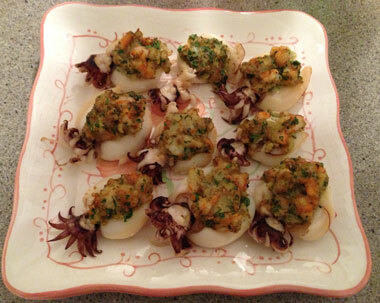 Although you may be tempted to add more garlic (I always am), I find more detracts from the cuttlefish. Let cool slightly and then mix with the shrimp, parsley, whole wheat bread crumbs, lemon zest and black pepper. Beat one egg and add to the mix. Next we stuff the cuttlefish. How you stuff the cuttlefish depends on how it was cleaned. Cuttlefish are normally cleaned by cutting the body along its length on top, as in the picture. This is typical and the cut is normally made by the cuttlebone when removing it. Since I’ve always found cuttlefish cleaned, this isn’t an issue. There is a great cuttlefish cleaning video below if needed. If the cuttlefish was cleaned as squid normally are, leaving the tube (more of an oval shape with cuttlefish) intact and removing the innards and cartilage from the bottom where the head attaches, then stuff the cuttlefish loosely leaving room as it will shrink as it cooks. Do the same if using squid. Place into a baking pan or dish that has been lightly oiled with olive oil and bake for 375 degrees for 25 minutes uncovered. One tip: if you are not into tentacles (poor you, you don't know what you are missing! ), you can chop them and add them to the stuffing!